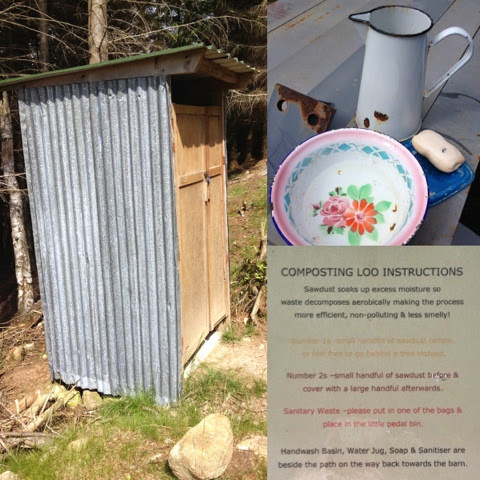 It was last October when I was on my Highland Foodie Road Trip that I picked up a leaflet for Wild Rose Escapes on a visit to the Bog Cotton Cafe at Cannich. 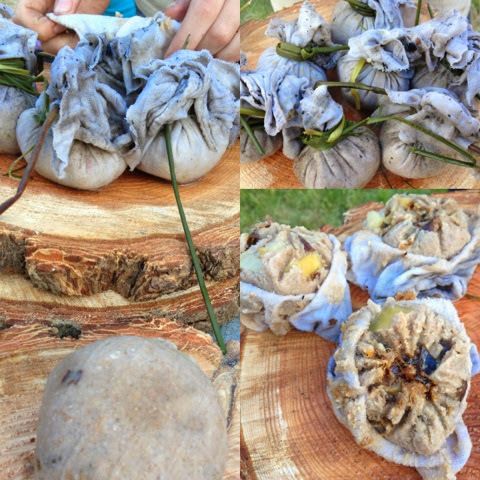 Wild Rose offer a range of interesting courses including natural dyeing, felt making and relaxation. 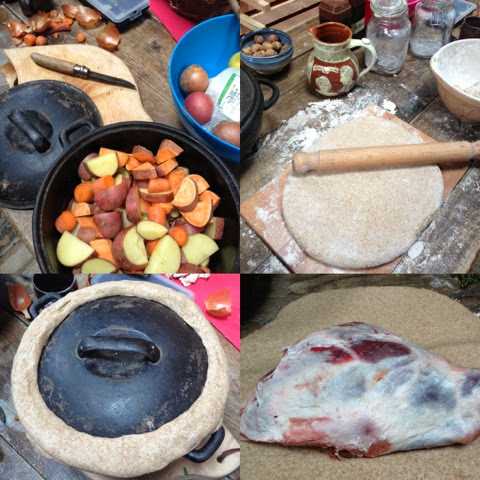 But the one which immediately grabbed my attention was Prehistoric Cooking. Fast forward to Christmas morning and a voucher duly arrived in my stocking for a weekend course. Much to his delight, boy was getting to come as my plus one. Foodie Loon dropped us off at Higher Crochail and headed off to spend some quality time with girl which included hunting for Nessie. It turned out that we were the only two enrolled for the weekend. 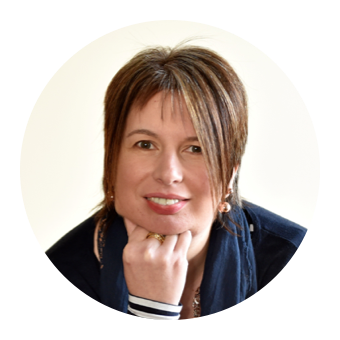 Would that mean undivided attention or would we have to do all the hard graft by ourselves?! We were made very welcome by Rosie and Alex and their daughter Thora and baby Martha. 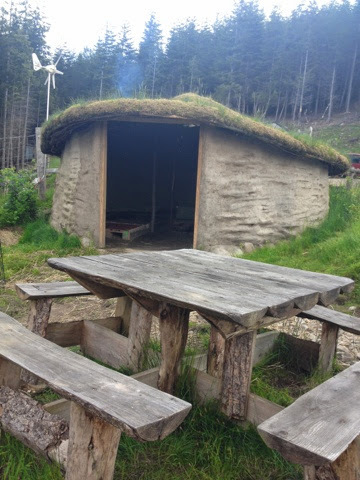 Time for a quick look around with a chance to drool over their amazing roundhouse and meet some of their livestock before it was time to get to work digging the pit to roast our dinner in. 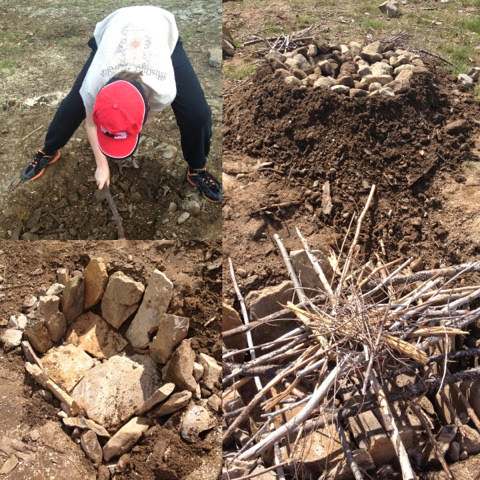 We used a combination of bones, antlers and modern day picks and spades to dig out our giant hole. 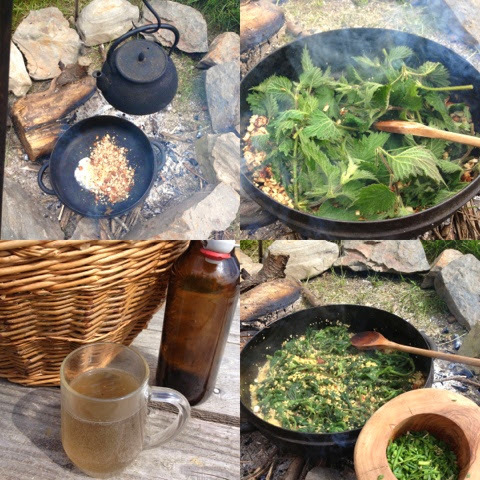 It was a scorcher of a day so a break for some refreshing nettle tea and homemade flapjacks was most welcome. With the pit almost dug it was time to seek out the perfect stones. 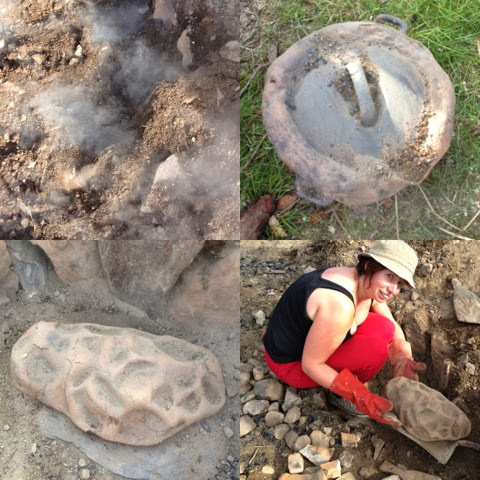 Large flat ones to line the bottom and sides and smaller round ones to heat up in the secondary fire. 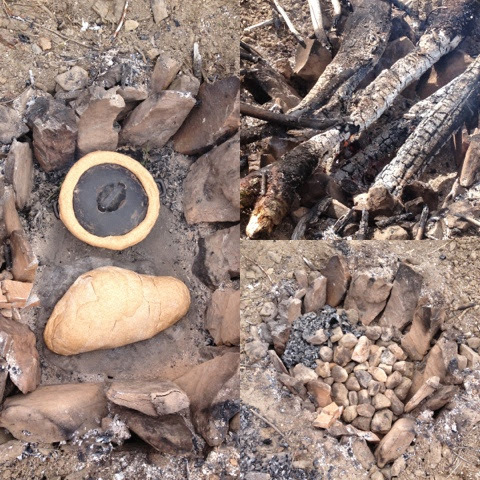 With the pit dug and two fires alight, food prep could begin. A big batch of dough was required to seal in our meat and veg. 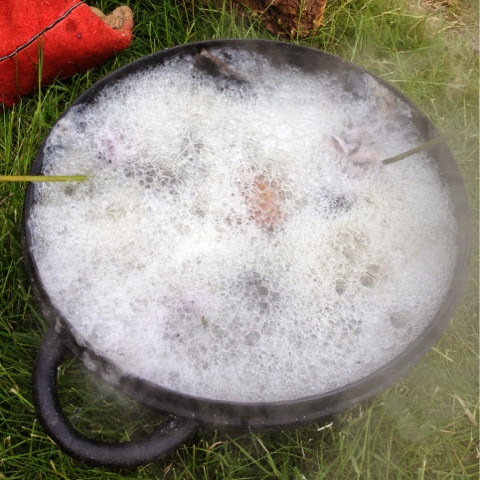 A cast iron casserole dish was filled with root vegetables and topped with foraged greens. Meanwhile a leg of hogget was parcelled up with dough. Both needed to be really well sealed to keep in the juices and the dirt out. The fires need to burn for a couple of hours before you clear out the oven and brush away any ashes and carefully lower in the food. 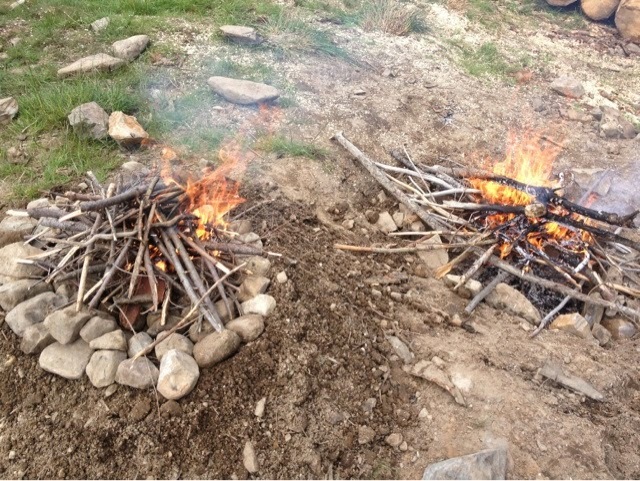 Next the hot stones are taken from the second fire and placed over the feast below. Earth and turf fills in the gaps and 4 hours later dinner will be ready. 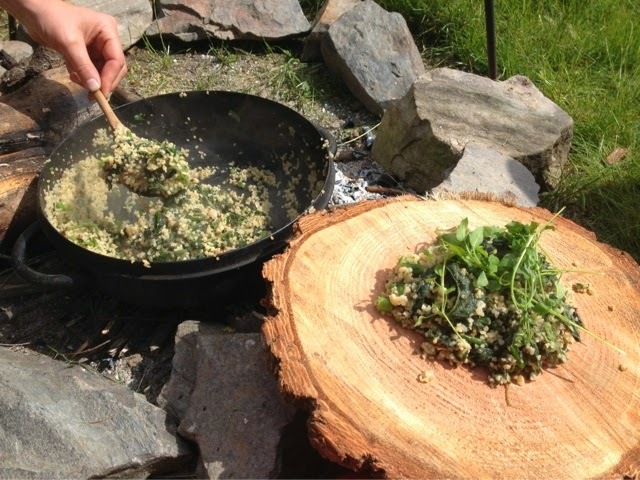 After a hard mornings graft it was time for lunch which was a spring greens stew made with foraged sorrel, nettles and chickweed. Bulgar wheat provided the carbs and hazelnuts the protein. 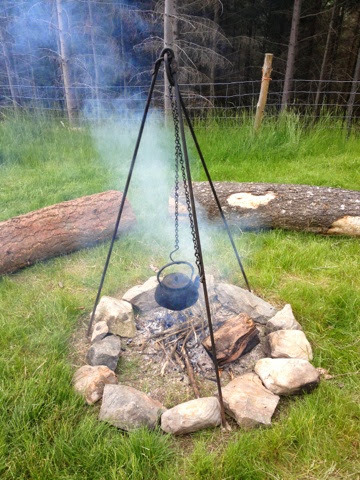 All washed down with Nettle Beer and served on wooden platters which after use on each side got burnt in the fire. Plenty more plates where they came from. Foodie Loon and Girl were to be joining us for dinner. In addition to our pit roasted main course we set to making a batch of sweet dumplings for desert containing oatmeal, dates and apples. These were to be cooked by stone/pot boiling. 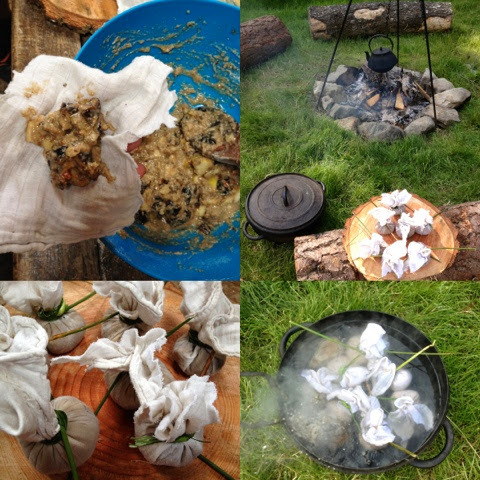 Stones were heated in the fire and then dropped into a pot of water containing the dumplings wrapped in muslin and tied with reeds. The effect was instant, spectacular and very effective. It was also fantastic fun. Time to open up the pit and see if our dinner was cooked. Still a tremendous heat as we carefully unearthed our dough encrusted food. 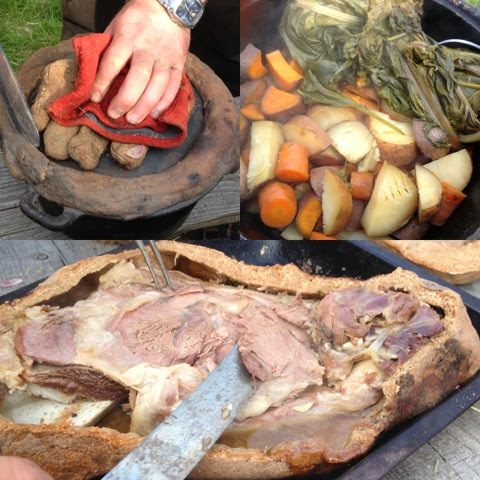 It was cooked to perfection and we sat down to enjoy a fantastic meal of lamb and veggies finished off with rowan jelly and an amazingly good bread sauce scraped from the inside of the dough that surrounded the meat. 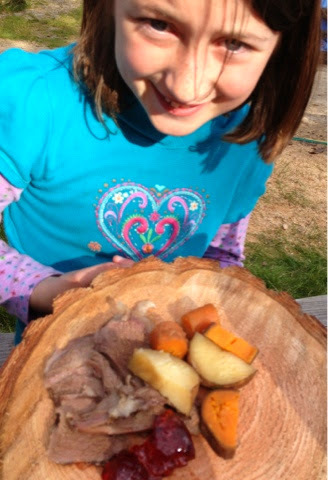 Even girl cleared her wooden plate, turned it over for desert and then threw it on the fire. 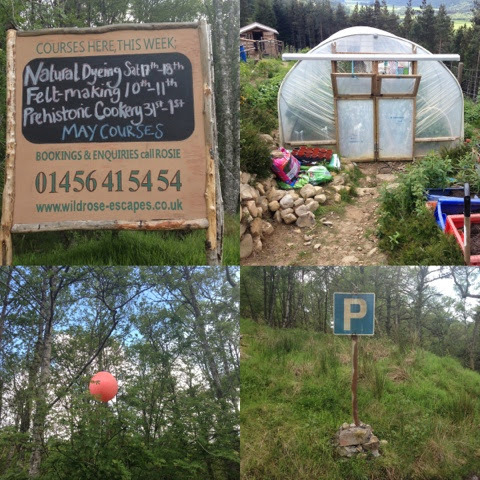 A fantastic first day had been had at Wild Rose Escapes. So much learnt in such wonderful surroundings. Time to head to our bed for the night at Cannich Campsite in preparation for day two. 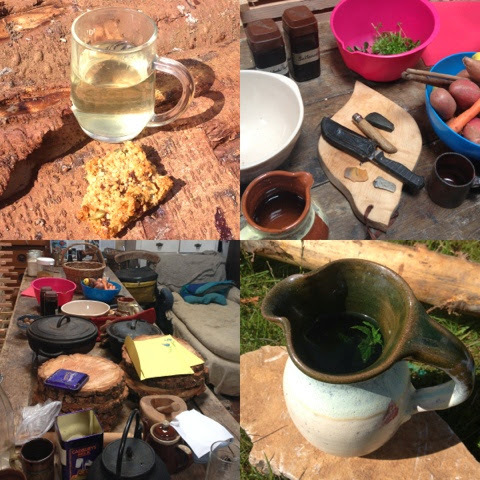 Day 2 - Clay baked fish, gorse flower pancakes, fireside flatbreads and a chicken called Mary on the blog soon. Mmmm, would love to try that Spring Green Stew! Looks fab, and looks like a fun experience! 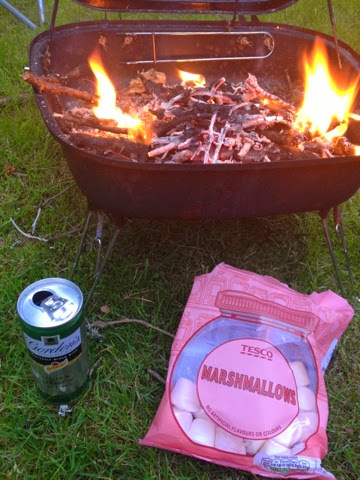 Wow I didn't know they had marshmallows in pre-historic times! What an amazing experience. It sounds like great fun (if a little exhausting!). We were allowed to revert back to present day in the evening. Although I bet there was a prehistoric version of G&T! This sounds awesome!!! Right up my street. Love the shot of a tin of Gordon's G&T at the end too ;-) good to know you hadn't gone back to prehistoric times completely! There's only so much back to basics that I can cope with. G&T is a must in whatever time period. Wow, that is seriously impressive - I am not sure I would last very long. 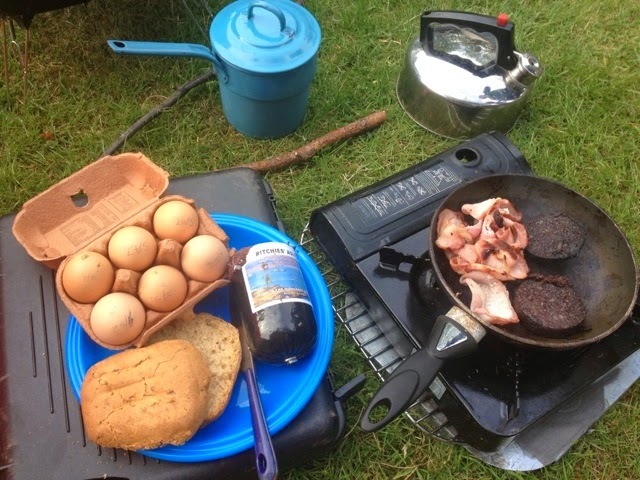 We had our 21st century comforts in the evening, if you can call camping a comfort!